Select a suitable page size form the 'Layout' drop-down and select 'Envelope' from the 'Templates' drop-down to draw Envelope guide lines on the designer. Full page (1 Row 1 Col) will give the largest Envelope. The guide lines are faintly drawn on the designer, so you can position elements correctly on the Envelope before printing, cutting and folding. 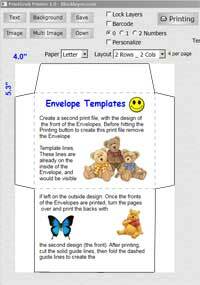 The inside of Envelope itself is the letter, so add text, images and Personalized Name list to the central and lower rectangles, which will be revealed when the Envelope is opened and unfolded. 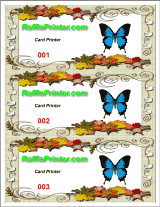 Create a second print file, with the design of the front of the Envelopes. 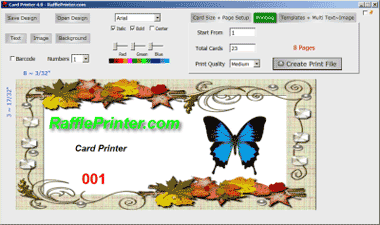 Before hitting the Create Print File button to create this print file, remove the Envelope Template lines. These lines are already on the inside of the Envelope, and would be visible if left on the outside design. Once the inside of the Envelopes are printed, turn the pages over and print the backs with the second design (the front of the Envelope). After printing, cut the solid guide lines, then fold the dashed guide lines to create the Envelope.